At times, life seems almost mundane in the aftermath of Becca (Joelle Golda) and Howie’s (Sean Harrigan) loss of their four-year-old child. Amid folding baby clothes, listening to Becca’s younger sister Izzy’s (Alexia Dox) story of a barroom brawl, and baking cookies in the kitchen, life is blissfully trivial. And yet it doesn’t take long to realize that beneath these simple everyday scenes flows a strong undercurrent of tragedy. Can anyone really wrap his or her head around the absurdity of death? The answer, according to playwright David Lindsey-Abaire, is no. And yet, however pointless and abstract accidental death may seem, understanding it is exactly what the characters in Rabbit Hole are forced to do. 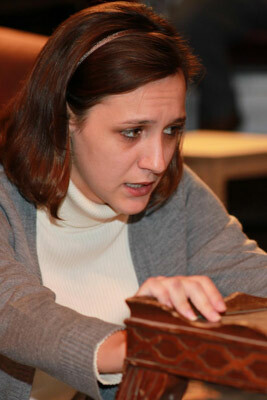 Joelle Golda was outstanding as Becca, the bereaved mother in <em>Rabbit Hole</em>. Rabbit Hole does not attempt to propose an answer as to how we should cope with death or which methods are healthiest. As we see in a memorable scene between Howie and Becca, in which Becca has accidentally taped over a home movie of their son, the urge to blame or to find one’s own blame in the face of death is overpowering. And yet Rabbit Hole never plunges into an overwrought, overly sentimental treatment on how we cope with death. 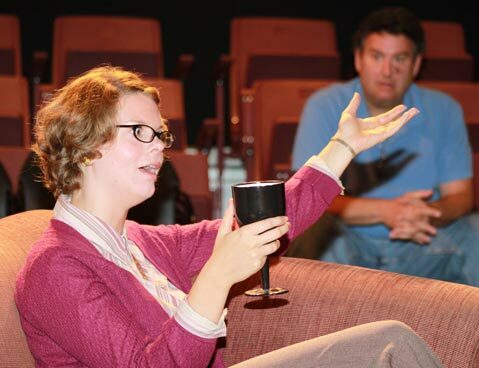 In an especially comedic performance as Becca’s mother, Nat, Annabelle Rollison describes concepts such as the “Kennedy Curse” as feeble attempts people make to comfort themselves. “People want things to make sense,” she says, a line that becomes more meaningful when we learn that she, too, has survived the loss of a son. Rabbit Hole‘s multilayered complexity requires a balance between fantastic comic timing and gut-wrenching emotional performance, and although the full cast does not always realize this balance, director Irwin Appel nevertheless gets terrific performances from the leads, Golda and Harrigan. Golda makes it difficult not to feel her character’s pain with lines like, “People sound like they’re talking, but it’s so much more …” As Howie, Harrigan transforms from an even-keeled, good-natured husband into a feverish and angry bereaved father with notable finesse. While Rabbit Hole provides no easy answers, it suggests that we embrace and try to understand the sometimes violent and raw emotion that bubbles to the surface in the most banal situations. These rabbit holes of grief are to be relished rather than reviled, for even as they isolate us and make us lonely, they also provide an opportunity for people to come closer together.